It hasn’t even been released yet, but somehow, James Cameron’s Avatar has already forged a permanent place in our pop cultural consciouciousness. It’s place was solidified Wednesday night when Cameron’s blue alien eco-movie was paralleled by South Park in their latest episode “Dances with Smurfs”. South Park uses real Smurfs, in Dances with Wolves style movie made by Cartman. 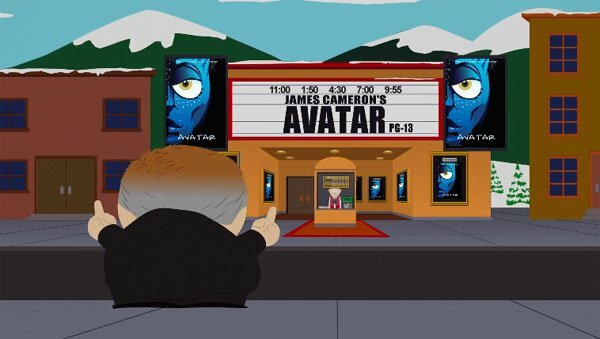 But just in case there’s any doubt as to what the show’s little blue creatures were really meant to represent, the show ends with Cartman going to see Avatar and realizing that he’s just been ripped off by James Cameron. Get in line buddy. And for those of you with more time on your hands, click here for the entire episode (the bit in which Cartman goes to see Avatar pops up at the end).